Public awareness of the consequences of hidden moisture continues to escalate as the insurance industry moves away from covering moisture based claims and/or owners are subjected to health risks from mold. 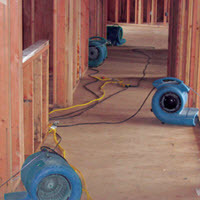 Hidden moisture is not just a concern of the home buyer. 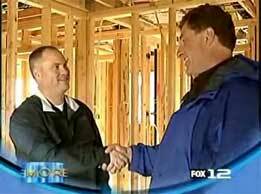 The builder has an investment as well. Excessive moisture in the structure, coupled with fluctuating temperatures, leads to potentially damaging expanding and contracting of the building envelope. As a builder, your post construction costs can be dramatically reduced by properly drying the structure during construction. 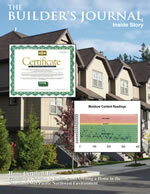 Certifying newly constructed homes to meet or exceed moisture content building standards inside the home. Our technicians, using the latest technology, detect moisture content of the interior walls, floors and crawl space during construction. If excess moisture exists, HCI will utilize our specialized drying process to remove moisture from the structure. HCI's drying process is significantly faster, more effective and ultimately more cost effective than allowing the structure to air-dry or using the furnace. Specifies the individual moisture content readings recorded by room. The Dry Score™ Certificate will add value as a marketing tool by informing home buyers that you have engaged an independent company to certify that your quality homes are Dry Inside™. In addition, we will retain the data collected from each individual home in our database in case a post-construction incident occurs.